Download Price Quotes to Microsoft Money After Microsoft Pulls the Plug. This is part 4 in my series for replacing Microsoft Money. I gave my requirements in part 1. I looked at Quicken and GnuCash in parts 2 and 3. This time I’m looking at Moneydance. Moneydance is a Java application that runs on Linux, Mac, and Windows. Unlike GnuCash, MoneyDance is not free. It’s made by a small company called The Infinite Kind. As far as I can tell, the application is primarily developed by one developer Sean Reilly. A Moneydance license costs $40. There is a trial version that limits to 100 transactions. I tested Moneydance 2008r4 on Windows. Moneydance starts up quickly. The home page looks nice and clean. 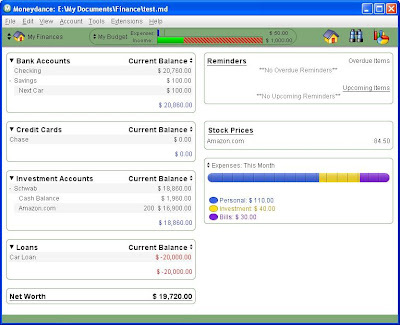 The default setup gives you a checking account, a savings account, and a number of income and expense categories. You can edit these income and expense categories however you want. Moneydance is more intuitive than GnuCash. The terminologies are familiar. There are Accounts, Categories, and Securities. You can still nest accounts within another account. For example, you can create a sub-account in Savings for the next car and create another sub-account in Savings for the next vacation. Entering transactions is somewhat non-intuitive. New transactions are entered at the bottom of the register, as opposed in the register itself. There is not a concept for a payee. The “Description” field is used for payees. Each entry in the bank account register uses two lines by default. There is no way to view only one line. You can choose to see only one line (see comment from Joe). I was quite confused when I was trying to enter a stock purchase. 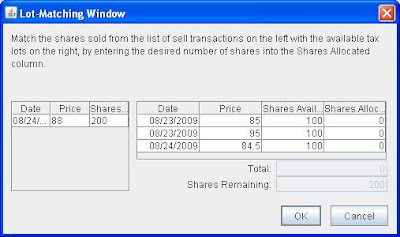 The price per share is entered below the number of shares. I expected them to be on the same line. 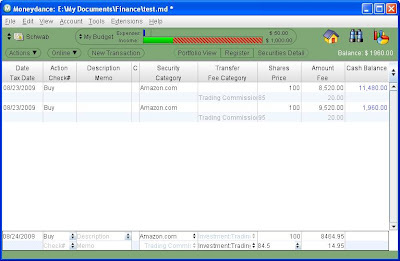 Every entry in the investment account register uses two lines. There is no way to view only one line. Once I get over the register entries though, Moneydance works just fine. Loan payments can be automatically calculated to split between principal and interest. They can post automatically to the register monthly. There are some reports in Moneydance but the reports are not very customizable. You can select one account or all accounts, but not some-but-not-all accounts. There is a report for capital gains and losses but I didn’t see anything related to investment return percentages. You can see more screenshots on Moneydance’s web site. Like GnuCash, Moneydance also imports QIF files. Moneydance provides step-by-step instructions for importing from Microsoft Money. When I posted a question about the instructions on their support forum, I got an answer in 15 minutes. That’s very impressive. Unfortunately the answers from the Moneydance support staff were not what I was hoping for, although it’s not necessarily Moneydance’s fault. Importing QIF files still requires exporting from Money one account at a time. The transfer transactions in Money will likely create duplicates. They said it’s impossible for them to develop an importing tool that works on the entire Money file. Overall Moneydance is a good application. I’m not used to its user interface in some areas, but I’m sure I can get over them. The prospect of taking off the straitjacket for downloading transactions and quotes is really enticing. If I end up using Moneydance, I will just start fresh and not bother with importing. There is an easy way to view your register as one line: while in the register, right click in the window and choose “Single Line Mode” or “Two Line Mode”. Or use the keyboard shortcuts ctrl-alt-1 or ctrl-alt-2. When you switch to one line mode, that sticks and will be your new default. This works for checking, savings, credit cards and all categories. But investment accounts can only show Two Line Mode. Do you really want to invest all your time and effort in a program that is from a one-man shop? How long will this program be in existence? I’m not a big fan of Intuit, but I am reasonably confident that they will be around in ten years. Moneydance – I don’t know…. @Joe – Thanks. I didn’t see the option for one line view in the menu. Did not discover right click. I updated the post. @MK Trail – I’m not afraid of using a product from a small company, or even a one-man shop. A small company has some unique advantages. It doesn’t need much revenue to sustain itself. If I’m the developer and my application generates $500k in revenue every year, I’d be happy to maintain it forever. If I also have a day job, I’d be happy to do it even for $100k. That same $500k revenue would be peanuts to a large corporation. A company as large as Microsoft abandoned the Money product after more than 15 years. If Microsoft simply gifted the product to the lead developer in the Money team now, I’m sure the product will have a much better chance to live on. Just from Googling, I see that Moneydance has existed since at least 2001. From reading that Macworld review, I see it has improved over these years to a point where it’s quite usable today. It does not have to overtake Quicken to be viable. Have you checked out mint.com yet? HAHA – No…I’ll go with a big reliable company, like Microsoft! They’ll never let me down…. Gee, I am glad to see somone with your expertise working on “our problem”. out by Intuit. Wonder what that’s all about… better Quicken/Mint product ?? and let us know what it is. Phil – I decided to stay with Money after its expiration date. See follow-up posts Replacing Microsoft Money, Part 5: OFX Scripts and Security Quote Script for Microsoft Money. I abandoned Windows about 2.5 years ago, just sick of dealing with it. I had been using Quicken 99 for YEARS (so upgrades are not THAT important to me if the basic program does want I want it to do, But MoneyDance will let you upgrade to the latest for 4 or 5 years without additional charges). I switched to Linux after windows and even ran Quicken99 under WINE for a while, but I wanted something native. I found MoneyDance to be a GREAT replacement for Quicken. I loved that for my $40, I got a decent program that would run on Linux, or Mac, or Windows (NOTE that you can have ALL THREE running at the same time for the same $40, see their website for the licence info). When my Linux box broke down and I had to buy hardware, I refused to buy a Windows machine and went Mac. A quick download from MoneyDance website (the Mac version) and copy my ONE data file (not like Quicken’s 6 files), i was up and running in minutes, with all my colors, presets, and everything just where I left it. I still switch the data files to my linux netbook when traveling to keep everything up to date, then back to the mac when I get home. Seamless, I love it. Try the demo for yourself for free ! I FINALLY ditched pc computers and EVERYTHING Microsoft this week. I have beed a Quicken user since their first product release so I was looking for financial software that I could learn to use easily. The reviews for Quicken for Mac convinced me not to buy it. I made the mistake of buying iBank and it would not import my QIF files properly and it was impossible to figure it out. The ‘documentation was even worse. I downloaded a couple of free programs and didn’t like them either. My husband, a CPA, researched and found MoneyDance for me. I downloaded the free trial today and WOW, just what I was looking for Everything imported perfectly, it’s intuitive and easy to learn,. I like the clean, simple check register. I have only used it a short while, but it does everything I am used to and need. Well, the latest update to Quicken broke it. All the stock and mutual fund price histories are gone. True, I can re-download the last 5 years, but my investment data went back to 1999 and some of my other data to 1972 (Anyone remember Managing your Money? Now there was a good program). Also the password vault is 80% gone. I’ve disliked Quicken for a long time – maybe it’s finally time to try something else! I don’t know if it has improved, but when I tried to import my Money data to Moneydance a couple of years ago, it was a mess, with lots of duplicate and missing entries. Not being a data wizard or very patient, it was enough to turn me off to this alternative, since I cannot see abandoning my ten plus years of data. I am a long time user of Quicken (Canadian) and was forced to go to 2009 version which I really detest. I made the terrible mistake of downloading from investment accounts and now my registers are full of “placeholders”. There HAS to be something else! I used GnuCash for several years and Quicken 2009 since it’s release. My requirements are almost identical to TFB’s. In GnuCash, I was never able to set up automatic downloads from my bank accounts. This is the main reason I switched to Quicken. Now, I’m looking forward to switch to Moneydance. The main reason – I need an application that would run on both Linux and Windows. Another reason – interface. 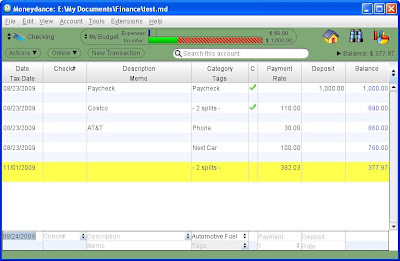 Quicken interface is messy. It fees like Winchester Mystery House with rooms added without a master plan. Moneydance runs on Linux and has clean interface. One small feature I love in Moneydance. When I transfer $300 to savings and then move $100 back into checking, Moneydance shows a cash flow of $200 into savings. Both Quicken and GnuCash would report cash flow of $300 out and $100 in. Similarly, if I buy stuff at Home Depot for $50 and return $30 of merchandise that did not work for me, Moneydance would report a cash flow of $20 to “Home improvement” category. Both Quicken and GnuCash would report $50 expense and $30 income from “Home improvement” which does not make any sense. I was looking for a software that would report just the net for 7 years. For those concerned about data transfers. In Quicken, I exported 2 years of transaction history from ~15 accounts into a single QIF file, then imported the file into Moneydance – that’s it. So far, I like Moneydance. I am an old man who had a stroke. I want a simple program that will help with money and a few investments. I do not want to online accounts to a bank of financial company. I have a Quicken for years. I have switched to a Mac. Trying to find a program that will work for me. Moneydance sounds good but I can’t get answer to one question! How much does it cost? 50/mouth or 50/year. I don’t $50 per month just to balance a checkbook! It’s a one-time purchase, not per month or per year.